Tammy Gillis was interested in the theater throughout school but was later discovered for modeling at university. Fortunately for us, she soon found herself on the set of Canadian countryman and legend, Guy Maddin, and has been acting professionally ever since. You’ve probably seen her at the heart of many of your favorite shows who film up north – Supernatural, Girlfriends’ Guide to Divorce, Once Upon a Time and Lost Girl – and Siren is but the latest. As Deputy Marissa Staub, she’s grounding the fantasy drama with a little no-nonsense reality. Here we ask her fan questions and talk about what’s coming up on season 2 of Siren and what it means for her character. Please describe Season Two in three words – @elinesryn. Three words. Oh, my goodness, this is … “more mermaids coming”. How’s that? I know that’s the tagline for the second season. I’m curious if “more mermaids” means a darker, more dangerous season, too? Hmm. That’s a tough one. I can’t give anything away. How would you look at the mermaids from a larger cultural standpoint? What do you think they represent? Well, I think that part of it is representative of what we’re doing to the environment. We’re driving these creatures to land because they’re starving. I think, also, another part of it is that they’re these foreign creatures that are now having to integrate themselves into society. So, I think it’s also about how they’re adapting, but also how, especially, the town of Bristol Cove is adapting to having them there. What I feel is really smart about the creators of Siren is they do insert some political commentary into the show. They sort of touched a little bit on Me Too with the whole assault that Ryn had. So, they do touch on things and you’re definitely gonna see more of that this season. I was curious about that, ’cause I see them as a metaphor for what’s happening with immigration right now. It will be interesting to see how, if any, the show touches upon that. I can’t say any more than I said. That’s always the tense part, ’cause your hands are so tied. Deputy Marissa has been on the outside of the know when it comes to the merfolk. Will that change, and if so, will it be fairly early into the season? Or is that something that’s gonna evolve for her? I can’t really comment on that. 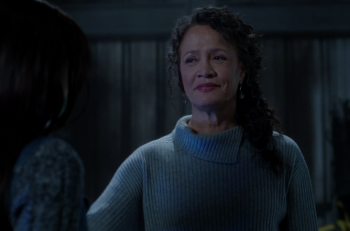 But I can say that for my character this season, I sat down and I re-watched the entire season and I had to… I sort of wrote a little show bible for myself about what Marissa’s actually aware of and what Tammy is aware of, having watched the show. There were times where it would be that I might possibly get confused about that, because having watched the show, I’m aware of all these things that are happening. But is Marissa actually aware of them? I had to really make a big effort to look at my notes before every episode and be really clear for myself what I knew as Marissa and what I didn’t. Again, I can’t really answer that question. There would be spoilers everywhere. Will we get a chance to know Marissa more personally? As far as who she really interacts with, any relationships she has? Things like that. Well, in my sort of backstory for Marissa, I really decided that she grew up in this town. She has grown up with all these people. I come from a really small town, as well, so I sort of transferred some of what that experience was like into what it would have been like for Marissa. And in small towns, everybody knows everybody. Everybody’s in everybody’s business. There are secrets that are kept, and I feel like, for Marissa, she has these friendships and these relationships with people, but then she also has to do her job. So, I feel like, possibly at times, she might be torn between the two. Also, a lot of the first season was… I feel Marissa’s very by-the-book, and she wants to do the right thing and follow the letter of the law. A lot of the time, the sheriff would let things go. So, there are definitely a lot of questions that she has as to being a good cop, and him being her mentor, and why is he constantly, sort of, looking the other way? Well, that tells me we might see a little bit of head bumping between them. I can’t really say, but I can tell you a couple of my scenes from the first season that I really enjoyed. One of my favorite scenes, for sure, was when I found Ryn on the docks, and I brought her in. I thought it was really interesting, the way it played out where she came peacefully with me, but not so much with the male deputies. I also really, really loved a lot of the scenes that I had with the sheriff, Gil Birmingham. Just because he’s such a powerhouse of an actor, and he’s just so lovely and generous. It’s really incredible just being in a scene with someone like him. I don’t know, but—oh! that reminds me of this one that was hilarious. Oh, my goodness. We were shooting this one scene – I won’t say who specifically the characters were – but one of the main actors just could not get the lines out, and it literally started a ten-minute laughing attack of everybody else that was in the scene. And it’s kind of a heavy scene, so we really kind of had to take a moment to all calm down. It’s moments like that that are so great, but also, it’s such a family. Everybody on Siren has become such a family. The whole cast and the crew. They’re all incredible. We’re really, really lucky. And a lot of the cast spend a lot of time together. Everybody’s really close and very supportive. Just being a part of all that, and being on a set that has that feeling, it just makes going to work just so amazing. If you were to be any kind of supernatural creature, what would it be and why? I really love the idea of being a mermaid because I grew up spending a lot of time in the water. I swam a lot, and we went camping and spent time in the lakes. I also, eventually, became a lifeguard, because I spent a month swimming every day for two or three hours a day. So, I love the idea of being a mermaid, and going down and seeing all these amazing creatures, and exploring all these things. But also, having … I feel like they have a bit of that outsider perspective… while also being part of this really incredible family. I think it would be awesome, too. You also have the power of the siren song. And then, according to Siren, at least, very magical superpowers of strength. I feel like they’re gonna build on the folklore more than we’ve seen in other kinds of media. Yeah, I think so. Also, because this season there’s more episodes. Last season we had ten episodes and this season, there’s sixteen. So, I think there’s a little bit more room to explore more of that, as well. If you had the opportunity to go in the water on the show, is that something that you’d be really excited to do? It depends on if I’m human, one hundred percent human or if I’m, maybe, part mermaid. It also depends what time of year it is in Vancouver. I’ve just gotta say, I have so much respect for all the cast that play the fishermen and all the cast that play the mermaids because they’ve had to, at times, go in the water and/or come out of the water and it has not been very warm here. I remember seeing the training videos last year in the pool and all the practice it took to get used to the fins and things. I would imagine you’d have to be very athletic in order to pull off that. Oh, absolutely. They spent so much time training, not only just for the fins, the movement of the mermaids, the swimming, but also, they had to do breathing, sort of, classes. I’m pretty sure Eline is up to at least four minutes, if not longer, with holding her breath underwater. Because to capture their facial expressions and emotion, obviously, they have to hold their breath without any breath escaping, any bubbles. They’re just absolutely amazing. If you had to use one word to describe the atmosphere or tone of this season, what would it be? I think that there’s a lot of… I don’t wanna say “bravery,” but I feel like there are a lot of people that are taking risks in trusting. It’s a lot. I feel it’s sort of just who to trust, and should we trust, and that kind of thing. Who are we safe with? I think that applies, kind of, across the board. If you could play any other character on the show, who would it be and why? You know what? I think it’d be Jerry, ’cause Jerry always seems to be the happiest and having the most fun. And he gets to play with the animals a lot. The show has and will tackle a number of social topics: addiction, death, environmentalism. What do you think is the most profound thing Siren has tackled and is there an issue you would like to see it address? Well, one of the things that I really love about our show is how diverse our cast is and how normal it is. Because that’s the real world… it’s very diverse, and I just love how we have such a diverse cast and everyone has just completely accepted it. I think it’s a beautiful thing to be showing to more and more people. What do you think you as a fan watching Season Two are the most excited to see? I’m excited to see where the relationship with Ben and Maddie and Ryn go. I feel like a lot of us, the fans and even me as a fan of the show, we’re really interested in rooting for them to figure this out. It’s such an extreme situation but the fairytales — and I feel like it’s almost like a fairytale, you know, Ryn is this sort of mystical character — that we always want the fairytale happy ending. Last question, we’re called Talk Nerdy with Us because we all have an inner-nerd. So, what do you nerd out about? Oh, my goodness. I am a huge nerd for learning. Right now, I’m currently obsessed with all these online programs. I just bought this new camera, so I’m trying to figure out how to use it and be amazing at it. There’s the ISO, the aperture, the fisheye and… like, literally, I’ll push a button on there and then something’ll happen and I’ll just be like, “Oh, my goodness. How do I reset this?” So, I’m currently obsessed with trying to figure it out, but I love the online learning programs. Please give a follow to Tammy on Twitter and Instagram. And be sure to catch Siren season 2 when it premieres this Thursday on Freeform.